Wall Street Killer - Scam or Not? Wall Street Killer - Scam or Not? More and more binary trading software is now being developed and finding its way into the industry. This binary options trading robots are very beneficial especially to the busy traders who have little or no time to stay in front of their computers to trade. The robots do all the trading and the trader only collects his profits and leaves the work to the software. The robot ends up making the trading process much easier and stress-free. However, the binary options trader has to be extra careful when it comes to entrusting his or her hard earned investments to a trading software. Nowadays, there are very many fraudsters claiming to have developed excellent trading robots while in the real sense they are just scams after your money. That is why we are dedicated to doing in depth research to ensure that binary options traders have all the necessary information on any binary options trading software. 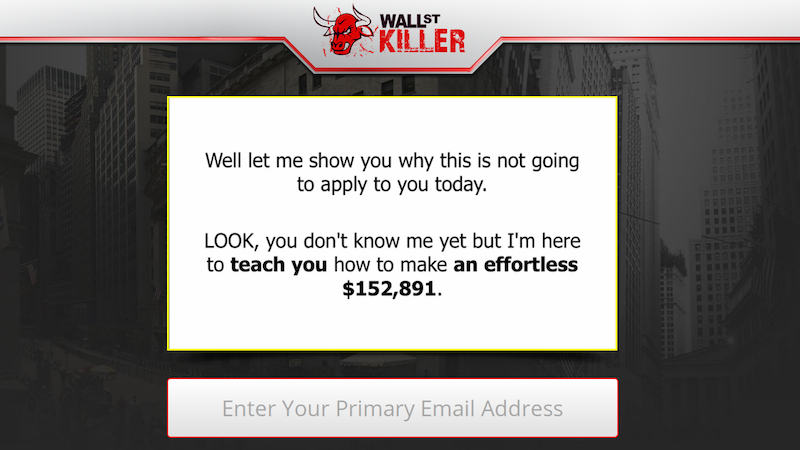 Wall Street Killer – is it a scam or is it legit? Read our entire Wall Street Killer to find out. What Is Wall Street Killer? Wall Street Killer is a binary options trading software or robot. It was created by a developer who goes by the name Jennifer Simpress. Simpress claims that she created this trading application so as to widen the number of millionaires in wall street. Jennifer Simpress has made an introductory video where she claims that this trading application is capable of generating profits of up to $3,000 in a day and $152,000 in the year. She also claims that the profits will definitely go up four times every next year. These are very unrealistic figures and it is hard to believe that any binary options trading application is capable of attaining such profits. The developer also claims that this trading robot just trades for 12 minutes in a day; meaning the $3,000 profit that is made in a day is actually made just within the twelve minutes. This sounds like some kind of a joke. Within 12 minutes the trader pockets 3 grands! We could verify how much this was true since there are no feedbacks from traders who have made such amounts of money using this binary options trading robot. First of all, if a trader wants to use this binary options trading software, he or she should submit his or her email address through the software’s official website and after that the trader is redirected to a downloading link. The software is free to download. After downloading the Wall Street Killer software, the trader is then assigned a broker whom he or she should use without being given a chance to choose on his or her own. If the broker is unregistered and a scam, the trader’s trading account will end up being wiped out. The Wall Street Killer is programmed to operate in auto pilot mode to automatically place trades in the market. The developer, Ms Simpress, claims that this binary options trading software’s trading algorithm is based on mathematical theories and models of known mathematicians as well as scientists. The application is programmed to generate trading signals and also goes ahead and implement those binary options trading signals to place and close trades. Final Conclusion: Is Wall Street Killer a Scam? The available information from the official website of Wall Street Killer binary options trading software is very shallow. They have not provided any proof that this trading robot is capable of generating the crazy figures that they claim the robot can generate for the binary options traders. This makes the software suspicious since there are no concrete evidence to show that it is 100% legit. Also, from the fact that the trader gets assigned a broker without his or her consent, this could be a major scam. The broker assigned to the trader may be in cooperation with the developer to get money from binary options traders and especially newbies. Therefore, binary options traders should be warned if they want to use this software in trading binary options. You better struggle and make profits rather than use a scam binary options trading software and lose all your investments. Binary Minery review: Wall Street Killer: 1 stars.